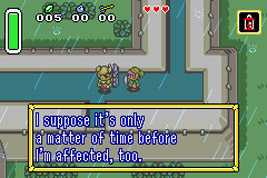 A remake of The Legend of Zelda: A Link to the Past for the Game Boy Advance, developed by Flagship. The main game is largely unchanged, although some text has been rewritten to be closer to the original Japanese text, improving ties with the later games in the series. There is also a new multiplayer option called Four Swords. Zelda is kidnapped by a creature known as Vaati and Link pulls the legendary Four Sword. Up to four players take control of the four Links as they battle through dungeons, working together to solve puzzles and competing for rupees.